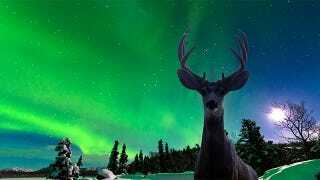 A new study published in the journal Psychological Science says that humans exposed to awesome natural phenomenon—like the aurora borealis or stunning landscapes like the Grand Canyon—may be more likely to believe in God and the supernatural. The researches exposed one group of participants to some awesome scenes from Planet Earth, the epic nature documentaries by the BBC. The other group were exposed to news clips. They found out that, after watching the videos, the ones exposed to the Planet Earth clips were more inclined to believe that there is a supernatural element controlling the word—a god or some other superior non-human being—than the ones exposed to news clips. ...participants who watched the awe-inspiring clips became increasingly intolerant of uncertainty. This particular mindset — a discomfort with uncertainty — may explain why feelings of awe produce a greater belief in the supernatural. I'm not surprised by these findings. After all, that's how the first beliefs of the supernatural and the development of religion itself started: Humans in awe looking for explanations of the natural phenomena that happened around them around 70,000 years ago, from totemism to animism to polytheism to monotheism. Of course, a minority of humans didn't go with the supernatural or divine explanation, and looked for other causes, which is what eventually brought us science and logical explanations to nature.